So lately (meaning last August), when I had turned 26, my skin has changed significantly. I started breaking out and my skin was as dull as ever. I thought it was all because of the new birth control I’ve been on (Depo, started in June 2012) so after my three months was up, I didn’t go back into my OB’s office to “replenish” in hopes that this would help clear up my breakouts. 6 months passed and I’m still breaking out like crazy. What could be the problem now? Age? I was obviously still using Noxzema as my face wash – since I was 14 years old – and just a standard moisturizing cream. WOW!! I was shock. Granted, I really only know what paraben is and I have no idea what the other stuff is. Haha! Though, I knew I had to give them a try. After all, I’m a beauty junkie. 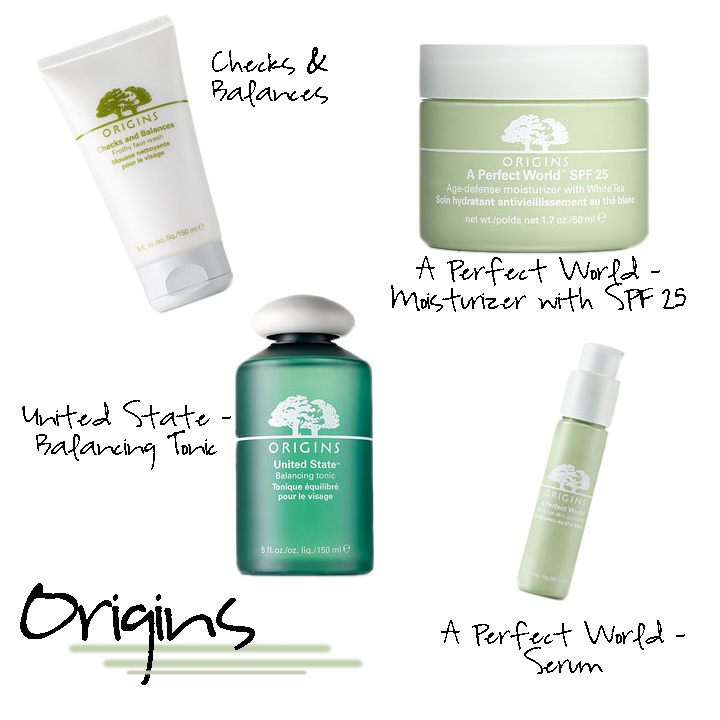 A few days later, I dropped by the Origins counter at Macy’s all ready to buy a few products to try. As I gave my main points of concerns to the sales rep, she pointed out a few products that I should try out. THEN, she asked if I would like some samples. Of course, I couldn’t resist, I was ready to purchase a full size bottle, but to get a sample for FREE? Obviously, Origins is confident enough that their products will not only work, but that I will fall in love. And let me tell you what, I did fall in love. These three itty bitty samples I got lasted me for 1.5ish weeks. I will be making another trip into Origins today on my way home to purchase the full-size products to see how much my skin really loves me within the next few weeks. I’ll update.